Home→ministry projects→God meant it for good: what an amazing year! 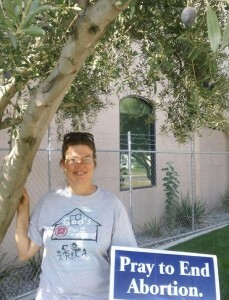 Terri stands under an olive tree outside new Planned Parenthood being constructed. In early June of 2012, when we first learned that Planned Parenthood was building a new mega abortion center in Bakersfield, we were daunted by the prospect of confronting this abortion “giant,” even though we had just heard an inspiring sermon on facing the giants. Driving by the construction site that first day, we immediately noticed the three olive trees near the sidewalk. Seeing the branches of the trees filled with olives, we identified this as being somehow an additional answer to prayer (similar to the olive tree outside the Bakersfield FPA abortion center), but we still didn’t understand how this could be true. When we learned the name of a contractor who was working on the project, we immediately recognized him as a prominent local Christian businessman. So we made arrangements to meet with him privately to ask him not to help build the abortion center. (During this time we had decided to keep the matter private, hoping to convince the contractor to quit before it became public.) He initially resisted our appeal, but eventually agreed to quit the project. Before we made the matter public, we also requested various documents from City Hall relating to the new building. Studying one of those documents which showed the layout of the new building, we noticed four rooms with wider doors. The location of these rooms adjacent to a lab and what appeared to be a recovery room led us to believe that these rooms were designed for surgical abortions. Experts with American Life League’s Stop Planned Parenthood project verified our suspicions, and passed the information on to a former Planned Parenthood manager who also confirmed that the building was designed as an abortion center. Further confirming our suspicions, we discovered that the Bakersfield Planned Parenthood office was advertising that they needed abortion assistants. Toward the end of June, we finally announced publicly our concerns about the new Planned Parenthood, gathering a crowd of concerned citizens at a Bakersfield City Council meeting. We had intended to ask the City Council to deny a permit for a parcel map merger, which was the only pending permit we could find for the project, but just a few hours before the City Council meeting we learned that the City would not be able to deny the permit, due to the requirements of the State Map Act. Outside City Hall that night, I confessed to those who had gathered to pray that I felt weak and helpless, but that the only thing I could do was to cling to God’s promise that when we are weak, He is strong (2 Corinthians 12:10). As we prayed for God to lead us after that first frustrating City Council meeting, God led me to ask the question, “if a city can’t do that (deny a permit for a parcel map merger), what can a city do?” We knew that jurisdiction is an important issue, and that some aspects of a city’s operation fall under the state and the country. But we also knew that ultimately God has the highest jurisdiction, because Jesus said “all authority has been given to Me in heaven and on earth” (Matthew 28:18). Any authority held by a country or state has ultimately been delegated to them by God. As I continued to read the Bakersfield Municipal Code, I looked for situations where something which would be legal outside the City of Bakersfield would not be legal within the City of Bakersfield. Some ordinances made me laugh, such as the one which makes it unlawful to “run, jump, skip or play” in any parking lot in the City (9.20.020). Eventually, the information I discovered in the Bakersfield Municipal Code led me to write the original version of the Human Life Ordinance. Before presenting the ordinance to the City Council, I sent it to several pro-life attorneys for comments. One attorney in particular, Katie Short of Life Legal Defense Foundation, had already been providing me with helpful ideas. She had suggested a zoning approach to the issue, but it seemed to me that it would be too late for such an approach to have any impact on the new Planned Parenthood. With Katie’s encouragement, I presented that first version of the Human Life Ordinance to the City Council in July 2012. In addition, we began meeting with pastors, seeking to gather a group of church leaders to sign a “Solemn Appeal” to the City Council (a document which was authored primarily by Royce Dunn, the founder of the National Life Chain movement). That Solemn Appeal was presented to the City Council in August 2012 by Pastor David Stepp, on behalf of about 40 local pastors. Over the next few months, we continued to attend every City Council meeting, asking the Council to consider the Human Life Ordinance. Often others such as pastors, students, and nurses also spoke to the City Council. When objections were raised, we made changes to the proposal to respond to the concerns. For example, we changed the word “person” to “human being” because a deputy city attorney claimed that the definition of the word “person” would conflict with state law. In September, City Attorney Ginny Gennaro expressed concern that the City could be sued for the Human Life Ordinance, telling the Council that she was working with Marylee Shrider, the new Director of Right to Life of Kern County to “put the matter to bed,” and that Shrider would be sending information against the Human Life Ordinance to the pastors who had signed the Solemn Appeal (months later, Shrider stated that Gennaro’s statement about contacting pastors was incorrect). In response to Gennaro’s concern about the prospect of a lawsuit against the City, attorney Katie Short had the idea of removing the penalty provisions and instead adding civil action language which had already been used successfully in an Oakland ordinance (although the Oakland ordinance was targeted instead at pro-lifers who exercised their Constitutionally-protected First Amendment rights). Throughout the 40 Days for Life campaign in September, October, and November, we tried to maintain a prayerful presence outside the Planned Parenthood construction site. Although our goal there was to fill only 12 hours per day (while continuing a 24 hour vigil outside the FPA abortion center), we failed to fill most of the hours. In the end our Planned Parenthood vigil showed our own weakness — but God once again revealed His strength through our weakness, as we learned of two more contractors who quit the Planned Parenthood project because of our small vigil. We had been told that the Planned Parenthood center was supposed to open in October, during the 40 Days for Life campaign, but the opening date was apparently delayed for months. Even after City Attorney Gennaro’s attempt to “put the matter to bed,” we continued speaking at City Council meetings. So in October, the City Council held a closed session meeting (violating the Brown Act) discussing the Human Life Ordinance, directing the City Attorney to write us a letter to stop us from coming to the meetings. When I learned of this, I decided that I would simply pretend it never happened, because the Council’s closed discussion was a violation of the law. However, I also decided not to raise the issue of this violation of the Brown Act, to avoid alienating any of the City Council members who had privately been supportive of our efforts. We decided to continue pursuing the goal of a public vote on the Human Life Ordinance, no matter what the vote had been in private. After the November election, we were pleased to learn that all of the members of the City Council now apparently claimed to be pro-life. Once again, God had shown His strength through our weakness, as we had failed to fulfill our intentions of contacting the candidates during the campaign to ascertain their views on abortion. When a December City Council meeting was scheduled on a Tuesday night (instead of the usual Wednesdays), we saw this as an opportunity for the City Council to hear from pastors who typically are not able to come to Wednesday night meetings due to their church responsibilities. We felt that the result was the most powerful City Council meeting yet (with Terri and myself not speaking at all), and it seemed that the City Council members received the pastors’ comments well. This was the first City Council meeting for the newly-elected members. Over the next few months we continued speaking at every City Council meeting, knowing that the new City Council members needed time to grasp the issues we were presenting. We became accustomed to the silence after we spoke, but did not allow the lack of response to deter us from continuing. At one of these City Council meetings, I expressed concern about some signs which had recently been posted in the public right of way outside the new Planned Parenthood building, which seemed to indicate that Planned Parenthood was preparing for abortions. Although the City Council did not respond in any way to my comments, within a few days the signs were gone. Finally on March 20, I went to the City Council meeting all by myself (while in the past we had always had a group attending the meeting or praying outside, no matter how many spoke to the Council). After I spoke to the Council, I began to walk out of the room (because the seating area was full), assuming that I would receive the usual response: nothing. But just before I got to the doorway, I heard the voice of Councilmember Sullivan, telling the Council that after all of the months of hearing from us, she thought that it was finally time for the Legislation and Litigation Committee to take a serious look at the Human Life Ordinance. I considered this March 20 breakthrough to be yet another example of God showing His strength through our weakness. More than that, I sensed His favor through the timing of this breakthrough. For over a year I had been planning to take my wife Terri on a cruise beginning on her 50th birthday, March 27. When I had first heard about the new Planned Parenthood, I had been concerned that the Planned Parenthood situation had the potential to ruin our plans for the cruise. It seemed that by March we could be facing some extremely difficult ministry circumstances. But when the Human Life Ordinance was sent to committee on March 20, it seemed to me that God was saying “Go ahead, get away for a while, relax!” Sending it to the committee gave us a two-month break from City Council meetings, with the committee meeting finally being scheduled for May 20. The negative result of the meeting was that it became clear that some committee members would be afraid to back the current proposal in fear that the City would be sued. In the end, Councilmember Jacquie Sullivan voted to table the matter — not to kill it, but to consider it again at a future date. That gave us time to work with attorneys in seeking to further strengthen the ordinance in response to the concerns which had been expressed. About a week before the May 20 committee meeting, abortionist Kermit Gosnell had been found guilty of murder. The trial exposed the deplorable conditions at his abortion center — conditions which are believed to mirror many abortion centers around the nation. As a result, state pro-life leaders asked us to approach the Bakersfield office of the Licensing and Certification division of the California Department of Public Health as part of a statewide investigation, to determine whether or not abortion “clinics” statewide were being inspected on a regular basis as required by law. It took a few weeks for us to get a response from our request. When we did receive the response, we were shocked to hear that according to the California Department of Public Health there are no “abortion clinics” in Kern, Kings or Tulare Counties (the counties served by the Bakersfield office)! The California Department of Public Health has no records relating to Bakersfield’s FPA abortion center (they didn’t even know it exists) because it is not a licensed medical facility! Yet Family Planning Associates is one of the largest abortion businesses in the state! But soon I learned that the California Department of Public Health had just inspected Bakersfield’s Planned Parenthood offices — both the old building and the new building. The CDPH representative who inspected Planned Parenthood assured me that based upon her inspection no abortion surgeries would be taking place in either building. Nevertheless, we know that the new Planned Parenthood building was designed for surgical abortions, so we will need to continue to watch what they are doing, with “eternal vigilance.” Even if no babies are ever surgically killed at Planned Parenthood, we need to continue to oppose the harm that this organization causes to our community. Almost a year after we began speaking out against their expansion, Planned Parenthood finally moved from their old building to their new building, many months later than they had reportedly planned to do so. But Planned Parenthood continues to refer women to Family Planning Associates for abortions, instead of killing children themselves. Meanwhile, we continue to move forward with the Human Life Ordinance, presenting an updated, stronger version of the proposal to the City Council for their consideration. We presented the latest version of the Human Life Ordinance to the group which gathered with us outside Planned Parenthood on July 8, and asked them to stay there and pray for us as we went to speak to the board of Right to Life of Kern County, which had granted our request to speak to them. As our friends prayed, we hoped that we could find new common ground with the RTLKC board, leaving behind our past differences and focusing together on our shared goal of saving women and children from abortion. We learned that several members of the RTLKC board are new to the local pro-life movement and were previously unfamiliar with the Human Life Ordinance. Regrettably, on July 15, the board issued an official statement opposing the Human Life Ordinance (although not all of the board members reportedly agreed with the organization’s official statement), apparently timed to coincide with the formation of a new “Pro-Choice Kern County” organization against us. Nevertheless, others who have served on the RTLKC board over the decades (including the remaining local founders of the organization) issued a statement in support of the Human Life Ordinance. Standing in the shade of the olive trees outside Planned Parenthood on July 8, we could see clearly how God has guided us throughout the past year, and how He has indeed been answering our prayers. The fact that the Human Life Ordinance is being discussed now more than ever, a year after many sought to easily dismiss it, is evidence to us of His hand of blessing. We look forward to continuing to follow His agenda, wherever it leads us, and pray for more local citizens to have the courage to speak up publicly for the value of every human life in our community. We continue to believe that God is leading us toward the end of abortion in Bakersfield, and that the Human Life Ordinance is part of this process. Every truth passes through three stages before it is recognized. In the first it is ridiculed…in the second it is opposed…and in the third it is regarded as self evident.